Scoreboard is up...10 points for first place and so on with 8th place getting 1 point. RESERVES (If you have a team member that deadbeats out feel free to ask one of these players to take the spot). 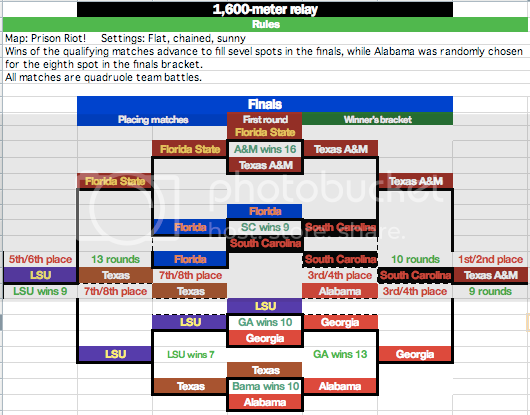 This tournament is designed to resemble the NCAA track and field championships with players competing as members of four-person teams. You can sign up as a team, or note that you are signing up individually and I will reserve some teams for those single players to get teamed up. Winners for this tournament will be each of the four players on the team that totals the most points through the 10 track and field events listed below. Games will be a mix of 1 vs. 1 play and multi-player games. 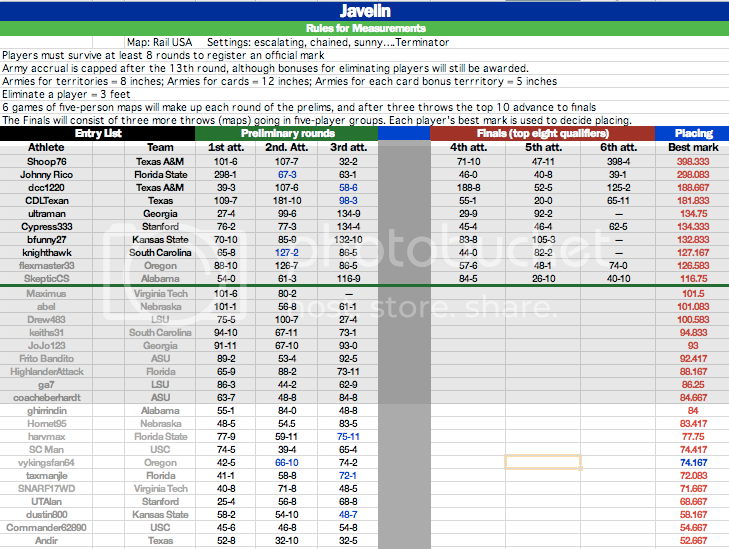 Each events have varying options, maps and ways of advancing. (Descriptions for each event are listed in the posts below)...I'm working out the details, but should get them all posted in the next day or two. Of course, these could change slightly depending on sign-ups. Right now, it's based on 16 teams (64 total players). The player listed #1 for each team will be designated as captain and will be in charge of assigning players to events. Each team should enter 2 players per event, but players can compete in a maximum of four events. *This excludes relays which will involve all four players on the team automatically. For example, JoJo123 could join the 100-meter dash, 5,000-meter run, triple jump and pole vault (he would also compete in the 400 and 1,600 relays). Last edited by flexmaster33 on Thu Feb 25, 2010 3:57 am, edited 74 times in total. 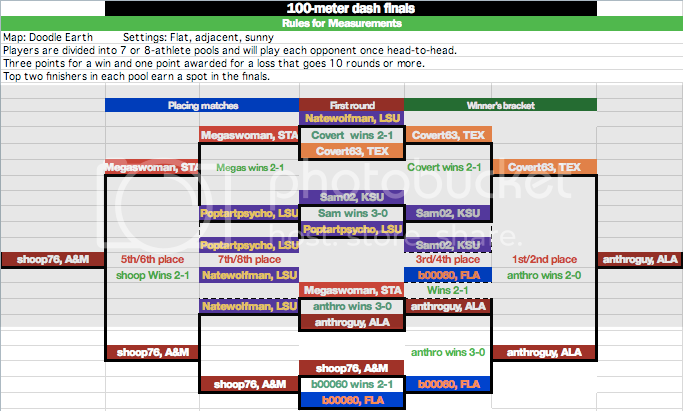 Congrats to Alabama's anthroguy on the win in the 100-meter dash...after squeezing into the finals with a 4-2 round-robin record he didn't lose a map the rest of the way. In a sidenote...booo60's third-place effort allowed the Gators to climb to the top of the standings through two total events. Last edited by flexmaster33 on Fri Sep 25, 2009 11:44 am, edited 17 times in total. 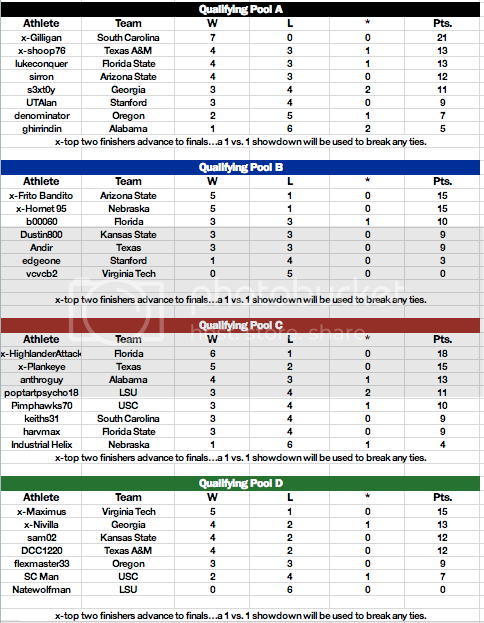 Finals: The eight qualifiers will be seeded into bracket play with a best-of-three format for each round. First-round winners advance to the best-of-three semifinals...first-round losers will drop into singles matches to decided places 5 through 8. Last edited by flexmaster33 on Fri Sep 25, 2009 11:46 am, edited 10 times in total. 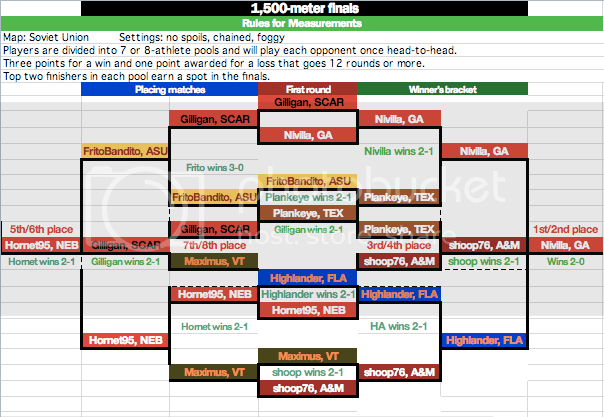 Finals: The eight qualifiers will be seeded into bracket play with a best-of-three format for each round. First-round winners advance to the best-of-three semifinals...first-round losers will drop into singles matches to decide places 5 through 8. Last edited by flexmaster33 on Fri Sep 25, 2009 11:47 am, edited 12 times in total. wow, it's been a long time between updates here...sorry about that...2 spots left before we can play the finals. Sent out the final prelim this morning. 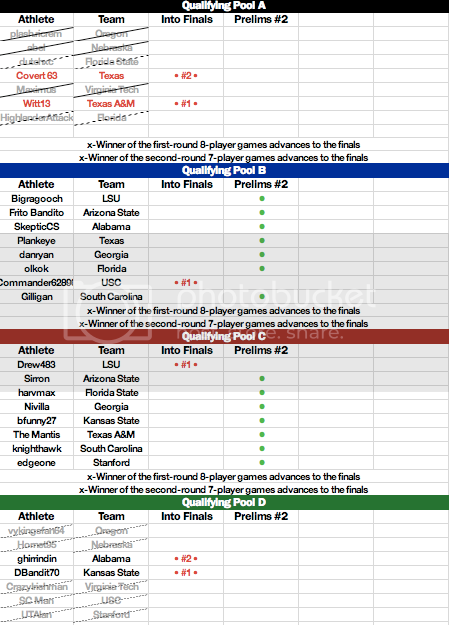 Players with a dot with be playing in the second round of prelims...not dot means you are still alive in prelim #1. Qualifying: Players will be divided into four races of 8-player World 2.1 battles. The winners advance to the championship finals, while the remaining 28 players will play a second qualifying round of 7-player World 2.1 battles with the winners there also advancing to the finals. Finals: The eight qualifiers will face off in a single 8-player battle on World 2.1...placing is based on how long you last in the game...first eliminated takes 8th place, while the winner of course scores first-place points. Last edited by flexmaster33 on Thu Feb 25, 2010 3:55 am, edited 12 times in total. The awards stand is up...Virginia Tech wins this event. Last edited by flexmaster33 on Mon Aug 17, 2009 12:22 pm, edited 15 times in total. Last edited by flexmaster33 on Thu Nov 12, 2009 2:45 am, edited 20 times in total. First attempts are wrapping up...blue #s mark games that have reached the 13-round cap, but players can still add to their mark by eliminating opponents. Finals -- Players will compete in a final series on each of the three maps, getting three more chances to improve their marks from the prelims. The best mark from each players' six games will be used for final ranking to decide the placers in this event. Last edited by flexmaster33 on Fri Jan 08, 2010 3:38 am, edited 10 times in total. 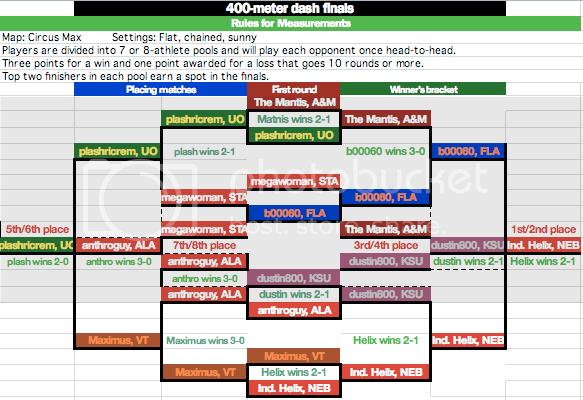 Qualifying: The bar is set at an opening height and players meet up in a series of 1 vs. 1 showdowns. Once you win your battle you advance to the next height, but once you collect three losses (missed) you are eliminated. Unlike in true track & field...missed attempts carry-over to each new height. When the bar moves up players with no misses with face others with no misses to start, while players with 2 misses will face others with 2 misses. Placing: The last player standing wins the event...the second-to-last standing takes second and so on through eighth place. In the case of a tie...I will tally the # of rounds needed for each victory and the player with the lowest total (quicker wins) will get the nod. Last edited by flexmaster33 on Sat Oct 24, 2009 2:42 am, edited 10 times in total. Qualifying: The bar is set at an opening height and players meet up in a series of 1 vs. 1 showdowns. Once you win your battle you advance to the next height, but once you collect three losses (missed) you are eliminated. Unlike in true track & field...missed attempts carry-over to each new height. When the bar moves up players with no misses with face others with no misses to start, while players with 2 misses will face others with 2 misses. Last edited by flexmaster33 on Sat Sep 26, 2009 2:58 am, edited 21 times in total. 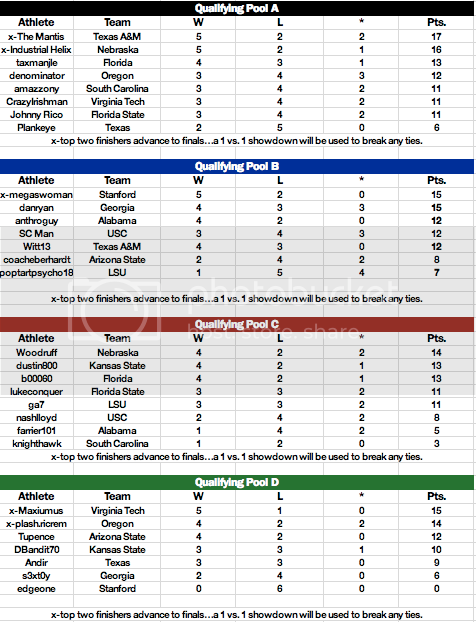 Qualifying: Teams meet in a head-to-head qualifying round with seven winners moving into the finals bracket, while Alabama was randomly selected to fill the eighth spot in the finals. All matches are quadruple team battles. Last edited by flexmaster33 on Sat Jan 23, 2010 2:39 am, edited 9 times in total. This tournament sounds like it'll be another creative/enjoyable endeavor from the mind of flexmaster33! While my days of track and field prowess ended in like the 8th grade, I shall come out of retirement to help buoy the Oregon Ducks chances of an NCAA championship. Plus, I've always thought I'd look dashing in a green track suit. have you seen how the U of O does things....they have an in with Nike...the track suit could be rainbow with a big O on it....or a purple speedo with a Donald Duck on the back. You never know what they're going to come up with...you've seen they're wild football unis right? For the purposes of this tourney, I'm asking the players on my team to wear a lime green unitard with a flourescent yellow O on the chest. Also, we all must play our games with a stuffed Donald Duck sitting next to our computer to inspire a rascally Donald-tude!!! Actually, I'm not much of a Duck fan, but it is Track City, USA and I love that. plash.ricrem wrote: This tournament sounds like it'll be another creative/enjoyable endeavor from the mind of flexmaster33! While my days of track and field prowess ended in like the 8th grade, I shall come out of retirement to help buoy the Oregon Ducks chances of an NCAA championship. Plus, I've always thought I'd look dashing in a green track suit. flexmaster33 wrote: For the purposes of this tourney, I'm asking the players on my team to wear a lime green unitard with a flourescent yellow O on the chest. Also, we all must play our games with a stuffed Donald Duck sitting next to our computer to inspire a rascally Donald-tude!!! I wear my unitard 24/7. It's kind of disturbing but my co-workers love it! Just a note to let me know if you want to captain your team...if it's not noted, then the first player to sign up for that team will be assigned captain duties. Of course, you can wait until your team is filled, then pm each other to discuss if you like. Hi flexmaster - great idea and it sounds like a blast. If you wouldn't mind, could I sign up for a NEBRASKA team (you don't have one listed, but you allude to possibly bringing in more teams)? I am more than happy to take individuals, but I plan to start recruiting right now for a full team (if you add an individual to my team, then I'll only recruit two more, for instance). Also, I do have a bit of a confusion. 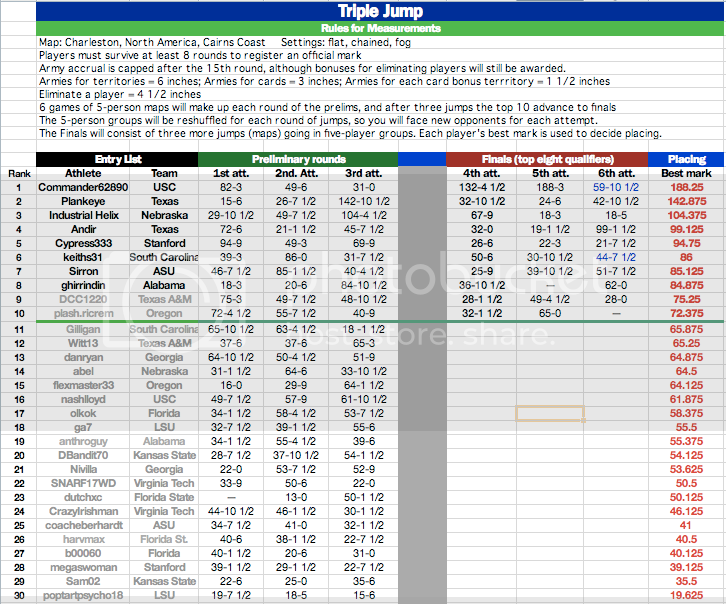 Your rules state "For example, JoJo123 could join the 100-meter dash, 5,000-meter run, triple jump and pole vault (he would also compete in the 400 and 1,600 relays)" - so you state that a player can only play in a maximum of four events, and yet you've signed your hypothetical JoJo123 up to participate in six. If we can't take Alabama, make it Kentucky. Last edited by Witt13 on Tue Jul 07, 2009 10:21 am, edited 1 time in total. Woodruff wrote: If you wouldn't mind, could I sign up for a NEBRASKA team (you don't have one listed, but you allude to possibly bringing in more teams)? 1) You're in as Nebraska...I've replaced BYU with the Huskers. And yes, people are welcome to represent different schools if they like. 2) All four players will take part in the 2 relay events...in addition each player can participate in four other events. A team can enter 2 athletes per event.